Candipolline Gold is a new pollen substitute and complete food for bees that is manufactured in Italy. It is made by adding sugar, milk, egg proteins and bee pollen and is excellent for stimulating the development of healthy brood. You can also use Candipolline Gold when there is little pollen available or as an emergency feed. You can feed it at any time of the year and there is no limit to the amount you can feed. To feed Candipolline Gold simply make a hole in the plastic bag and place over the hole in the crown board. 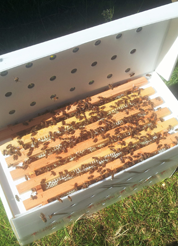 It keeps its consistency and will not set hard or get sticky in the hive. We use this as a feed for our bees and they really do love it.